Every year February Udaka Michishige hosts the hayashi kenkyūkai. In Japan a kenkyūkai is a meeting of people gathering for a day of intensive study. In this case we members of the Kei’un-Kai and INI (Udaka-sensei’s students) get together for a day of intensive noh practice. 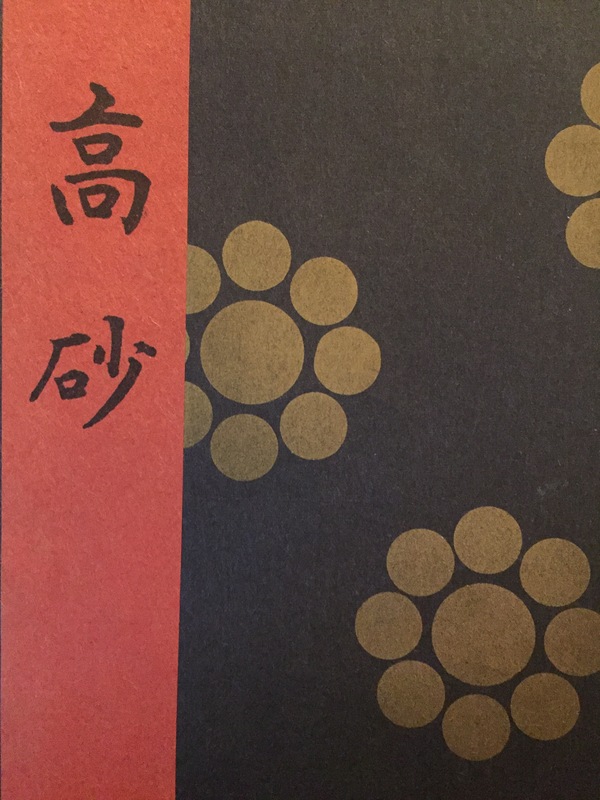 In a hayashi kenkyūkai we perform only maibayashi and full noh plays performed in kimono and hakama. Those of us who study instruments also join as musicians when we don’t chant or dance. This Sunday I am going to perform Takasago maibayashi, featuring the godan kamimai, one of the fastest dances in the Noh repertoire. I will also play the taiko for Makura Jidō maibayashi, featuring the gaku, another godan (five sections) dance. The kamimai is not my first godan dance: I already studied the godan hayamai for Tōru and the gaku for Kantan. However, the speed of the kamimai in Takasago is quite a challenge. It requires not only confidence in the movements, but also full understanding of the music, and ability to think well ahead in order to keep up with the fast tempo. Anyway, good luck to me! 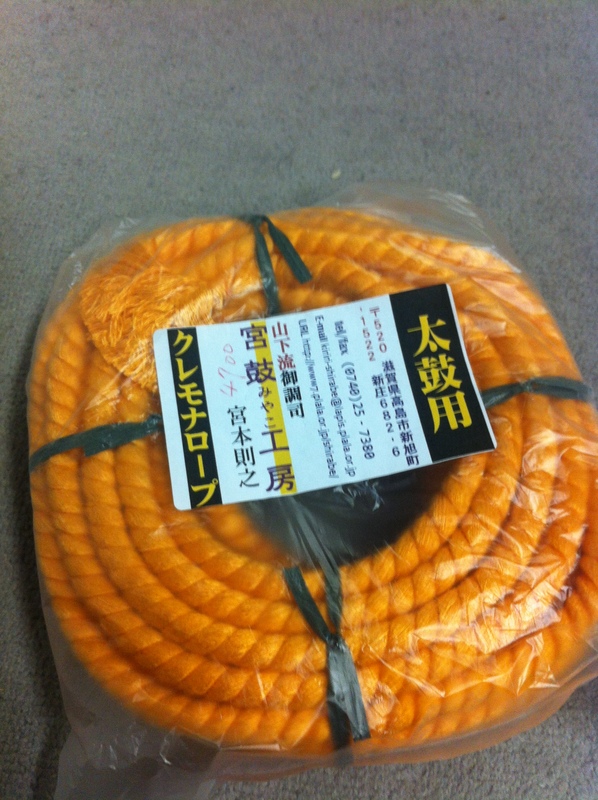 This is the kind of rope we use to tie up the two skins of a taiko stick drum. My teacher recently got this in order to replace the one on his taiko in Kyoto, which started to fray despite numerous applications of tsubaki abura (camelia oil). The label says, on the right, 太鼓用 (for taiko) and on the left クレモナロープ (Kuremona rope)… Cremona? Cremona is a beautiful Italian city in Lombardy, famous for its violin-making tradition and the cathedral, just an hour drive away from my hometown, Brescia. I was wondering what kind of connection the city might have with Japanese taiko… I started fantasizing of XVI century missionaries from Cremona visiting Japan and transmitting the ancient rope-making tradition from Cremona. A quick Wikipedia check demolished my fantasies: first of searching for ‘Cremona rope’ does not even bring up results other from Japanese pages, which points toward the label as being a Japanese invention. Second, Cremona rope is far from being traditional: it is a mix of vinyl and polyester fibers. Third, Cremona rope is made only by Japanese producer Kuraray – spelled クレラ (KURERA) in katakana. クレ is rendered KU-RE in alphabet, which can be rendered as CU-RE (kɾe) by Italian readers. KU-RE is the way Japanese spell KRE or CRE sounds, adding the [u] sound between K and RE. Long story short: KUREMONA is not Cremona [kɾeˈmoːna] but a pun with KURE from Kuraray and something else which I don’t even know. Blah.